In the staffing arena, it creates an impact for the business owner if he/ she is not being notified on consultants’ project end date. Consultants staying on bench will lead staffing owners to revenue loss. It hampers the overall growth of business, leading to impatient consultants because consultants never love to stay on bench and their retention is crucial for business owner, especially in staffing business. This saying does imply in here, because consultants are everything for a staffing business owner as they are assets, who plays a vital role in revenue generation. 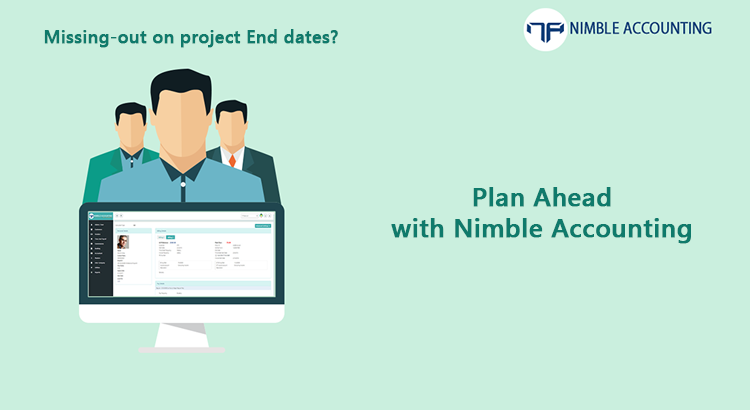 It’s crucial to stay connected & accountable with project end date! Getting notified prior to the project’s end date will be really a time-saver, as it helps you in managing your revenue from placing consultants on time. For instance, you have a space to inform your sales team to talk with the vendor to find out if there is an extension availed for the current project; also they can pitch for a better billing & higher hourly rate during the extension/ renewal process. Even if the project is going to end, you can compare the previous billing rate done for that particular project and look for a hike on the upcoming projects. By that way you can increase consultants’ hourly rate, retaining them by making happy besides yourself getting benefited. Everything is simplified & streamlined and readily retrieved from Nimble – Most comprehensive accounting software for Staffing businesses. It’s an undeniable fact that experienced consultants are more than anything for a staffing firm/agency and as a business owner, you should have a holistic approach to retain them, scoring profits and streamlining revenue planning. Impatient consultants are not productive nor healthy for your staffing business. Get them OFF from letting go even little closer to the ‘on bench’ situations, do it Nimble way and forecast project end dates and plan accordingly. Minimize this situation by planning your revenue wisely, notify your sales team about the current hourly pay rate of particular consultant for which the project end date is close by. Set a benchmark for the next project, leading happy consultants with better hourly rate and better business for your company. Happy consultants are always productive! Try Nimble Staffing – See Everything. Evade from the ‘consultant bench’ nightmares and stay well-informed and up-to-date on project start/ end date, Visa expiry, current pay rate of the consultants. Real-time alerts on pending H1B expiry, Consultants on Bench, Project End Date, Hourly Profitability Analysis, Head Count and unmatched visibility through ‘Consultant Center’ is enabled, altogether renders in revenue planning and bench period reduction of consultants. It’s not just confined in reducing bench period, but also proficient in handling myriad of accounting and business operations – Nimble Accounting stands as an ideal pick. Perform profitability analysis on individual consultant, plan your revenue efficiently for future projects and reduce any possible bench time process to enable higher business performance through unparalleled speed and visibility at NIMBLE. Why not have a glance at it!